Lynne first became interested in Dog Training when she took on an adult dog that came with ‘baggage’. Aggression to people and other dogs, destructiveness, separation anxiety and hyperactivity were just a few of the problems that she inherited. It took a lot of work to turn that dog around, but he became her inspiration and she has never looked back. That was a long time ago and she now dedicates her life to helping others with similar problems. 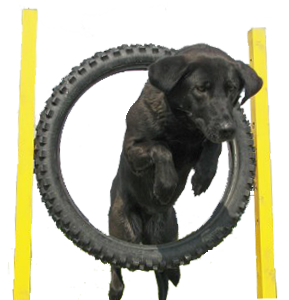 Once hooked on Canine Behaviour and Training way back in 1998, Lynne gained practical hands on experience from day one. Dealing on a daily basis with dogs with a wide range of behavioural needs means that there are no surprises when it comes to working with people and their dogs. Many of her clients are people who have sought help in the past from other sources but have sadly been unable to rectify the problems. Lynne has proved time and time again that she can help people with dogs that are on their last chance. She continues to learn more on a daily basis and feels that there will always be new techniques and theories to add to her dog training tool box. 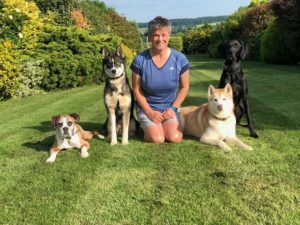 Lynne and her team have yet to discover a dog that they can nothelp, and take pride in the fact that they can match any dog and owner combination to a suitable training method which both can understand. “One glove” does not fit all! Different dogs have different needs.